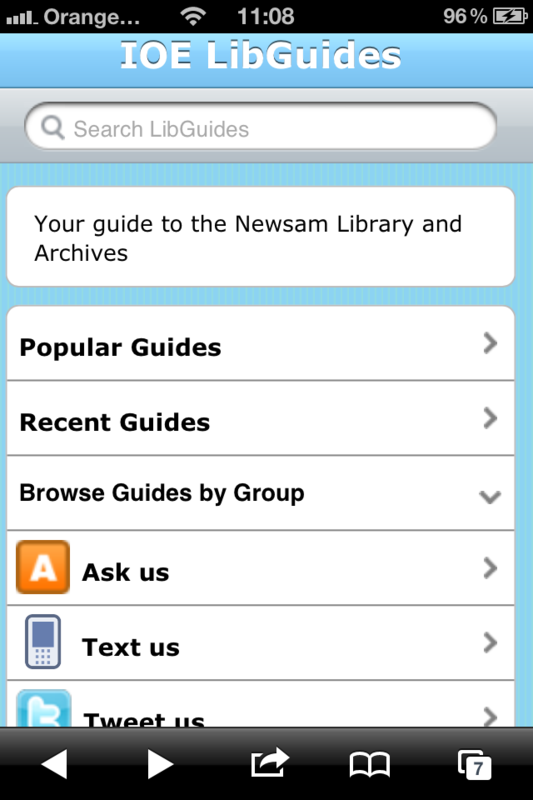 The start of the 2012-2013 academic year sees the official launch of IOE LibGuides – a guide to the Newsam Library & Archives. IOE LibGuides have replaced the static guides that were on the Library & Archives site, using powerful software developed in the United States by librarians for libraries. This software, by Springshare, is being used by thousands of academic, public and school libraries worldwide, including some of the Ivy League universities such as Harvard and Stanford in the U.S. and Oxford and Cambridge amongst others in the U.K. At the last count there were 3,400 libraries and over 51,000 librarians in 35 countries worldwide using the software and contributing and sharing information via the ‘Springshare Community’. Database publishers are also now starting to use the software; ProQuest have created a guide for a key education databases, BEI (British Education Index) at http://proquest.libguides.com/. The benefits of using Springshare’s LibGuides software are many: the creation and promotion of library guides highlighting resources is much easier than on content management systems; updates are instant; the software comes search-engine optimised so that LibGuides appear at the top of the list of results on Google and this in turn helps promote our collections more widely. We are also now part of a community of information professionals sharing best practice and information with experts around the globe and will be able to embed existing and emerging technologies, including social media, in our guides. IOE LibGuides are organised in three groups: guides to the various Collections, guides on Services available to library users, and How to… instructional guides on how to research and use technology to keep current or manage information etc. Each guide provides relevant information and promotes quality resources to support students and researchers at the Institute. The guides link directly to an online enquiry service called LibAnswers , via the ‘Ask Us’ option – users simply click on the option to be taken to a knowledge base where frequently asked questions are displayed and where they can ask us questions. 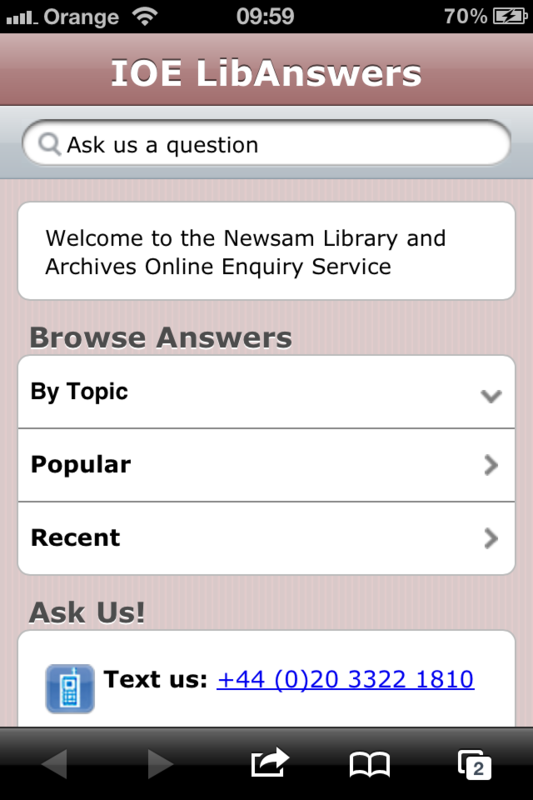 Students and staff can send their query by text to +44 20 3322 1810 or via Twitter @IOELibrary. LibGuides embeds new technologies and social media and will encourage users to interact with us in whatever medium they find comfortable and also allows for information to be displayed on mobile devices such as smart phones (a phone with access to the Internet) and tablets e.g. iPads. In addition, the information on LibGuides can be presented in an attractive way allowing Library & Archives to promote the various collections and aggregate information from different collections held at the IOE and from external sites. The potential of the software to embed new technologies such as digital video, images, bookmarks, and RSS feeds also provides the opportunity to develop user information and digital literacies. This is particularly appropriate at this time given that the Newsam Library is working with the Academic Writing Centre at the IOE on the ‘Digital Literacies as a PG Attribute’ project funded by JISC. Since June 2012, a Working Group made up of staff representing the different sections of the Library (Collection Development Services, User Services, Technical Services and Archives) have fine-tuned the site and created additional guides highlighting various collections, including the Archive and Special Collections. The site is being launched at the start of this academic year when the new cohort of students register. Existing students will be introduced to the guides at the Enquiry and Issue Desks and when they attend their information literacy training sessions. We hope that this new development in service will enable the Newsam Library & Archive collections to become more widely known and will inform researchers worldwide of the collections and services available at the IOE. 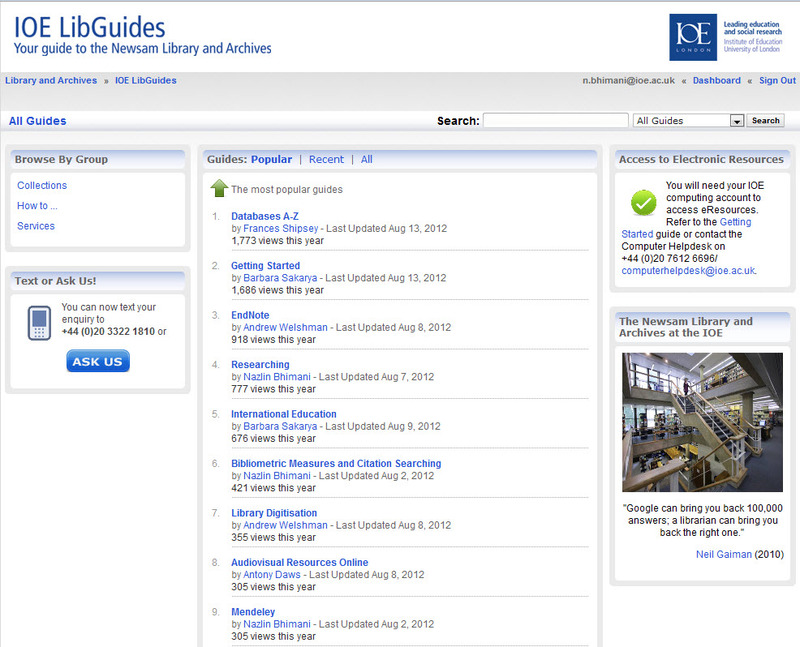 So do go and use IOE LibGuides yourself at libguides.ioe.ac.uk and let us know what you think! This entry was posted in Research Support and tagged collections, How to ..., IOE LibAnswers, IOE LibGuides, services, Springshare. Bookmark the permalink.